WARRANT ARREST – On July 23, 2015 at 6:16 pm, Patrolman David Bowden arrested Jarred Peet, 35 from Beachwood for an outstanding warrant from Wall Township. The arrest occurred at the intersection of Tiller Ave and Wave Street after Patrolman Bowden observed the subject in the area. THEFT – On July 23, 2015 at 1:30 pm, Patrolman Sean Langan responded to an address on the 1000 block of Mizzen Avenue for a theft report. Upon his arrival, the resident reported that a 1999 Gray Yamaha ATV was stolen from the garage. There was no forced entry to the garage and the resident advised that the theft took place sometime during the overnight hours. WARRANT ARREST – On July 25, 2015 at 1:15 pm, Patrolman Justin Apel received a call for a suspicious person walking on the Birch Street Bridge. Upon locating the subject, it was learned that the subject, Shawn Hock, 25 from South Toms River had an outstanding warrant from Brick Township. 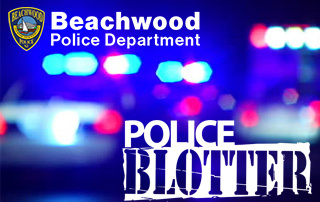 The subject was arrested and transported to Beachwood Police Headquarters where he was processed and turned over to Brick Police. WARRANT ARREST – On July 27, 2015 at 5:36 pm, officers were called to a residence on the 100 block of Beachwood Boulevard for a well being check. Upon checking on the resident, it was learned that he had an outstanding no bail warrant from the Ocean County Sheriff’s Department. Patrolman David Bowden arrested, Richard Corry, 3rd and transported him to the Ocean County Jail. CRIMINAL MISCHIEF – On July 27, 2015 at 9:20 am, Patrolman Adam O’Connor responded to the beach area, where he met personnel from the Public Works Department who advised that a piece of playground equipment was damaged. Public Works removed the damaged equipment to prevent any injuries if used. BURGLARY/THEFT – On July 28, 2015 at 9:07 pm, Patrolman Keith Meissner was dispatched to a residence on Bowline Street where the resident reported that their house was entered and items were stolen. The residence was unoccupied at the time of the incident which occurred sometime between 4:00pm on July 27th and 9:00pm on July 28th. Entry to the residence was gained when the actor(s) broke a window in a side door. The resident reported that jewelry was taken from the residence. THEFT – On July 29, 2015 at 1:23 am, Patrolman Allen Magory was dispatched to the 700 block of Pacific Avenue where a resident reported seeing a subject enter a neighbors vehicle. When observed by the caller, the subject fled the area prior to police arrival. Patrolman Magory made contact with owner of the vehicle who reported that an Ipod was taken from the vehicle which was unlocked at the time of the incident. Detective Adam Griesemer has been assigned to follow up. CRIMINAL MISCHIEF – On July 31, 2015 at 3:47 pm, Patrolman Adam O’Connor responded to a residence on the 900 block of Neptune Avenue for a report of damage to a vehicle. The resident reported that sometime during the overnight hours someone threw eggs at his vehicle. THEFT – On August 02, 2015 at 8:52 am, Patrolman Thomas Prince responded to a residence on the 1500 block of Mizzen Avenue for a theft report. Upon his arrival, the resident reported that 2 vehicles were entered and items stolen from within. The vehicles which were parked in the driveway were unlocked at the time of the incident which occurred at approximately 11:30pm on August 01. Officers also responded to two other residences; one located on the 1500 block of Windward Ave. and one located on the 1500 block of Spray Ave., on August 02, 2015 for similar incidents. THEFT – On August 04, 2015 at 8:12 am, Patrolman Phil Schena was dispatched to a residence on the 500 block of Cable Avenue for a theft report. The resident reported that several pieces of aluminum planking was stolen from the property. The incident occurred sometime between July 23rd and August 3rd.